A Cassoulet (kas′oo lā′) is a french inspired, slow cooked casserole of various meats and beans. My recipe has a little more of a broth base than some recipes in order to allow flexibility when using the slow cooker while still delivering good flavor. 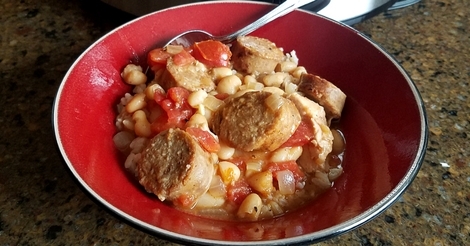 This is a warm your bones kind of dish that calls for easy to find ingredients (some cassoulet recipes call for exotic and expensive ingredients). To keep it family friendly, I use chicken broth, but you certainly can use white wine to keep in line with more traditional cassoulet recipes. If you are tempted to skip the step where you brown the meat, I don't recommend it! Browning the meat, especially the sausage really gives a lot of flavor and color to this dish. I hope you find it as tasty as my family did. Season both sides of the chicken with salt and pepper and place the thighs in a non-stick pan. Brown the chicken over medium heat about 3-4 minutes per side or until nicely browned. Place the browned chicken in a slow cooker. Return the same pan to the burner and add the polish sausage. Brown the sausage about 1-2 minutes per side. Transfer the browned sausage to the slow cooker as well, discarding any excess grease from the pan. Add the onions and garlic, sautéing 1-2 minutes on medium-low or until softened. Add the flour and stir well. Drain the liquid from the diced tomatoes into the pan with the onions and stir well. Continue to cook for 1-2 minutes until liquid is absorbed or reduced. Add the diced tomatoes, broth and seasonings. Continue to cook for 3-4 minutes. Pour this tomato mixture over the chicken and sausage in the slow cooker along with the drained cannellini beans and stir. Cook on low for 6-8 hours.